If you’re new to recumbent bicycles, you might wonder what the differences and advantages are. More fun than you’ve ever had on two wheels! If you want to see our recumbents in action, check out our model line-up video. The patent-pending Lightning ergonomic seat design places the rider in a naturally relaxed position, and gives full support for an incredibly comfortable ride. 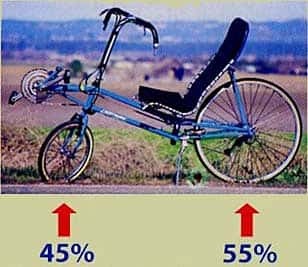 First, the seat bottom is at least three times larger than the seat on any upright bike; this means the pressure applied to your rear is only &frac13; that of an upright bike. Next, the shoulder high seat back supports you like no other bike can, eliminating almost all stress on your back. Additionally, the natural upright position means that almost no weight is placed on the neck, shoulders, arms, and hands, reducing or eliminating pain and soreness in these areas. And finally, the nylon mesh and cantilever of the seat absorb road shock, further helping to increase comfort. See more feedback from Lightning riders here. wheelbase and sliding crank boom. handling for all size riders. Braking distance is about ½ that of upright bicycles, and the possibility of going over the handlebars is eliminated. This is a result of the low center of gravity, and the 45% front / 55% rear weight distribution of the Lightning design. Additionally, the seat height and your eye level is similar to that of an average sedan. This fact, plus the upright head position, gives good visibility in traffic, and permits car drivers direct eye contact so they notice you more readily; as a result, safety is maximized. The ideal weight distribution, combined with a medium wheelbase and direct steering, delivers superb handling, response, and ride comfort. This great handling, along with the unmatched braking performance, makes it possible to avoid almost all unsafe situations. “Braking is fantastic, as nearly idiot-proof as it can be on a bike. Also, rough road performance is great for a recumbent.” — Bicycle Guide, May 1986. For 23 years, Lightning has maintained an active racing team for one reason; so that Lightning owners have the best bike possible. Top-level competition and elite riders put demands on bikes which cannot otherwise be duplicated. This ultimate testing ground allows us to rapidly test and implement significant improvements for all our models. Only Lightning, among recumbent manufacturers has set multiple world records and races predominantly with the exact same bikes we sell. The end result is a much higher level of performance, safety, comfort, and durability than comparably priced brands. The large Lightning speed advantage is partly due to the recumbent seat position, which presents less frontal area to the wind. As a result, speed increases 10 to 15% compared to a standard road or mountain bike. Addition of the optional Zzipper fairing produces an additional 10% speed advantage. Finally, for experienced riders, the F-40 fairing can be added to the P-38 or R-84; this results in speeds that are as much as double an ordinary bicycle’s performance. The Lightning is the best climbing recumbent available, similar to a road bike of equal weight. For more info go to our Climbing page. The Lightning is smaller than most recumbents and the same size as a standard bike. This means it can be transported on most car racks and is easy to park and store. An added benefit of the medium wheelbase is a six-foot turning radius. Some people unfamiliar with custom bicycles remark that the price of a Lightning is somewhat high. However, only the initial expense is high; over a period of a few years it can become FREE and even make you money. Mostly this can be accomplished by riding the bike on some occasions instead of driving your car. Additionally, the exercise you receive results in lower medical bills, not to mention a longer, healthier life span. Following is an example of how to calculate the payback period: The average cost for operating a car is 50 cents per mile. If you ride a bike for 2,000 miles a year instead of driving your vehicle, you are saving $1,000 (2,000 miles × 50 cents). Additional studies have shown that annual medical bills are about $500 lower for people who exercise regularly. Therefore, the two items add to annual savings of $1,500. In two years, a $3,000 Lightning P-38 has paid for itself; after 4 years, a $6,000 Lightning F-40 is now FREE. After this payback period, the bike is making you $1,500 a year! The close proximity of the cranks to the front wheel means your feet may hit the front wheel during slow, sharp turns. With practice, it is possible to make slow turns. In any event, this is a problem only below 6 mph. Also, pedal extenders are available which make this much less of a problem. Due to the different seat position, it takes a few minutes to learn the balance of a Lightning. Most people are riding with no problem after one day. It will take somewhat longer for your muscles to become accustomed to the different position and develop an efficient cadence. Clipless pedals and shoes make riding very efficient. After one month, most riders are proficient enough to surpass their best performance on a standard bike. Because the seat is fixed to the frame, the crankset adjusts back and forth to accommodate riders of different heights. Because of the high bottom bracket, your feet will NEVER scrape the ground while cornering. Also because of the high bottom bracket, your pedals will NEVER strike the curb while riding close to the edge of the road. The long chain gives the benefit of NEVER having to adjust the front derailleur while shifting the rear derailleur. Here’s a video of one Lightning owner’s first ride. Increased braking distance and possible flipping the bike. Bottom line: What works best for upright UCI racing bikes is not necessarily best for recumbent bikes. 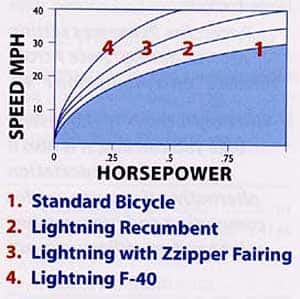 All Lightning bicycles are designed to last for many years of usage. We design them based on 10,000 miles of riding per year for 5 years. As few people ride a bike that much or that hard, most of our bikes are still in service after a decade or more of use. We stand behind our product without reservation. If you ever have a problem with your Lightning bike, we will do our best to resolve it. All Lightning frames and seats are covered by a 5-year warranty.